Fun, private and anonymous gay chat on your mobile. Just text the word MAN to 66365 for messages and profiles sent direct to your mobile. 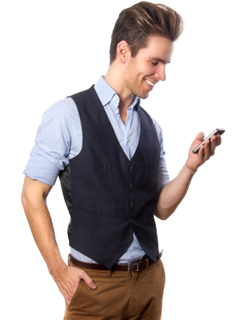 Try something different from phone chat or online dating and try our text chat service. Join today and you'll get hot matches texted you on your mobile phone - private, fun and totally addictive! Upload a photo of yourself and swap pictures with other members without having to complete a long online registration or profile. Join the growing community of gay guys texting right now and sign up today. Just text MAN to 66365 and we will text you matches of other men that have registered - you can get straight into the action without any long registration processes or credit card payments. If you know how to send a text then you'll be able to use our text service it's as easy as that. Chat and date on the go in the office, at work or on the train and no one will ever know! Remember to always play safe when meeting anyone through this phone service. Be safe and sensible. Meet your date in a public place and tell a friend where you will be going. Never give out your personal contact details or information when you have a one to one text conversation on this service. Click here for straight chatline action.